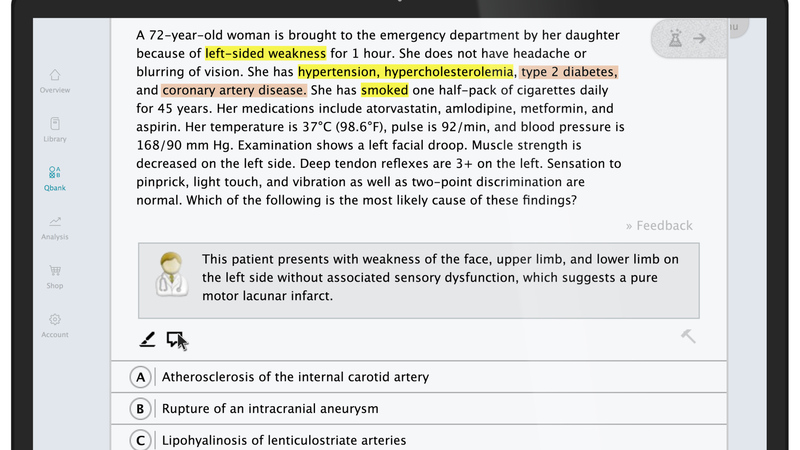 Did you know that AMBOSS provides helpful guidance for those tough questions and long stems you’ll face on your NBME Shelf and USMLE Step exams? Watch this quick video to see how to activate the Qbank Highlighting and Attending Tip functions. We’ve been in your shoes. As a medical student, you want to get through question stems as quickly and efficiently as possible and still answer the question correctly. It can be challenging to differentiate between what information is essential and what's just there to distract you. By activating the AMBOSS highlighting function, you can easily compare what you’ve highlighted with what's actually necessary to answer the question correctly. This way, you can train yourself to become a quick and efficient stem reader. When you’re struggling with an answer and you just need a clue, the AMBOSS Attending Tip provides an intermediate hint to help you solve tricky questions on your own. If you’re really stumped, the Attending Tip gives you that extra boost to point you in the right direction. Both of these functions (Qbank Highlighting and Attending Tip) can be activated or deactivated in case you don’t want the extra support—but the options are always available to pack that extra punch to your studying regime.